Spinal cord abscess is the swelling and irritation (inflammation) and the collection of infected material (pus) and germs in or around the spinal cord. A spinal cord abscess is caused by an infection inside the spine. An abscess of the spinal cord itself is very rare. A spinal abscess usually occurs as a complication of an epidural abscess. The pus is commonly covered by a lining or membrane that forms around the edges. The pus collection causes pressure on the spinal cord. The infection is usually due to bacteria. Often it is caused by a staphylococcus infection that spreads through the spine. It may be caused by tuberculosis in some areas of the world, but this is not as common today as it was in the past. In rare cases, the infection may be due to a fungus. The infection often begins in the bone (osteomyelitis). The bone infection may cause an epidural abscess to form. This abscess gets larger and presses on the spinal cord. The infection can spread to the cord itself. A spinal cord abscess is rare. When it does occur, it can be life threatening. Loss of movement of an area of the body below the abscess. Loss of sensation of an area of the body below the abscess. Low backache, often mild, but slowly gets worse, with pain moving to the hip, leg, or feet. Or, pain may spread to the shoulder, arm, or hand. The amount of nerve loss depends on where the abscess is located on the spine and how much it is compressing the spinal cord. 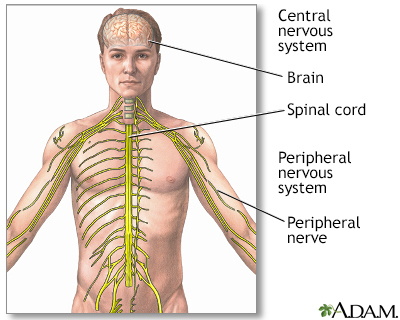 The goals of treatment are to relieve pressure on the spinal cord and cure the infection. Surgery may be done right away to relieve the pressure. It involves removing part of the spine bone and draining the abscess. Sometimes it is not possible to drain the abscess completely. Antibiotics are used to treat the infection. They are usually given through a vein (IV). How well a person does after treatment varies. Some people recover completely. An untreated spinal cord abscess can lead to spinal cord compression. It can cause permanent, severe paralysis and nerve loss. It may be life threatening. If the abscess is not drained completely, it may return or cause scarring in the spinal cord. The abscess can injure the spinal cord from direct pressure. Or, it can cut off the blood supply to the spinal cord. Go to the emergency room or call the local emergency number (such as 911), if you have symptoms of spinal cord abscess. Thorough treatment of boils, tuberculosis, and other infections decreases the risk. Early diagnosis and treatment are important to prevent complications. Camillo FX. Infections and tumors of the spine. In: Azar FM, Beaty JH, Canale ST, eds. Campbell's Operative Orthopaedics. 13th ed. Philadelphia, PA: Elsevier; 2017:chap 42. The vertebral column is made up of 26 bones that provide axial support to the trunk. 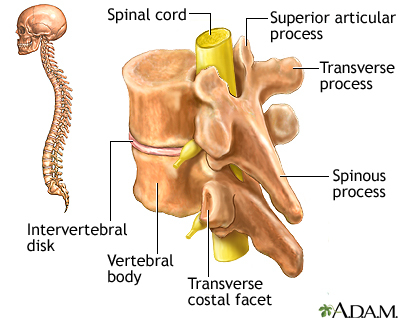 The vertebral column provides protection to the spinal cord, which runs through its central cavity. Between each vertebra is an intervertebral disk, which acts as a shock absorber.